What’s the difference between 2-way and 4-way stretch? Many of you on the internet are often searching and wondering…what is the difference is between 2-way and 4-way stretch? We’re here to help! Great question! 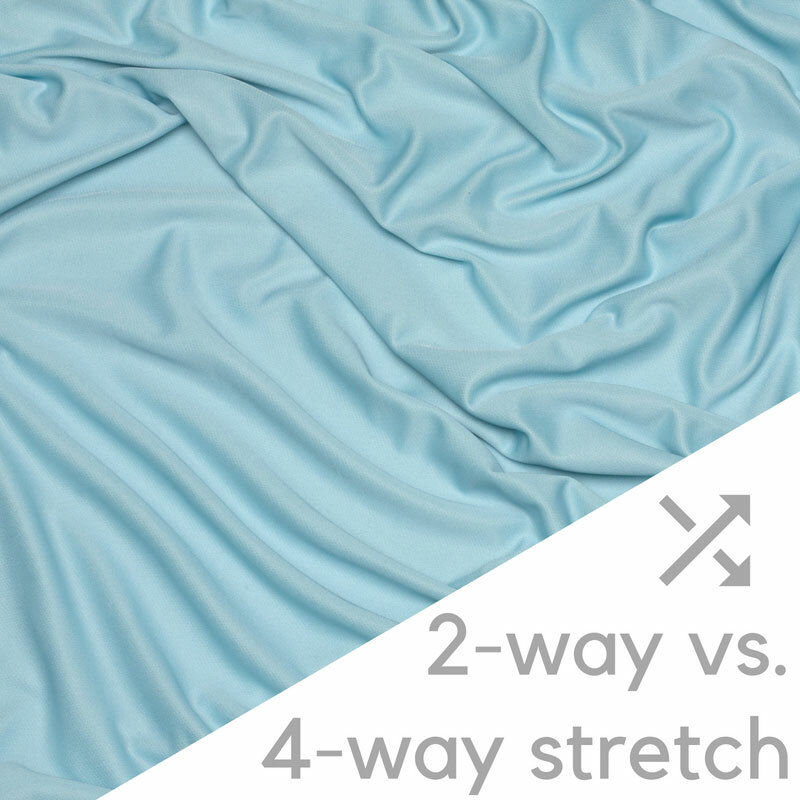 So, what really is the difference between 2-way and 4-way stretch in fabrics? And what does that mean for your sheet selecting process? At Wicked Sheets, we have spent the past 10 years perfecting the “perfect sheet” that meets your sleeping needs. The research has been done and the report is in! Stretch fabric is, simply put, a synthetic fabric that stretches. And even more simply put, a 2-way fabric stretches two ways and a 4-way fabric stretches in all four ways, crosswise and lengthwise. See, 2-way and 4-way stretch aren’t hard to get! Depending on the way the fabric is knitted, 2-way stretching fabric typically stretches from the selvedge edge to the other selvedge edge. Selvedge, sometimes referred to as selvage, is what they call a self-finishing edge. It doesn’t require a hem or any additional sewing to keep the edges from fraying or unraveling. Other fabrics with more yarn or knit fiber, often require a hem or a bias tape to stop them from unraveling. At Wicked Sheets, not only have we specifically chosen a 2-way stretch to decrease the amount of fiber types we are using, we also chose one that stretches from selvedge edge to selvedge edge. This way, our sewing team always know which way to sew the fabric to ensure that our customers always know which way the right way is to make the bed! And don’t think I can get through a post without talking about how wonderful synthetic fabrics really are! The first artificial fabrics were created back in the 1880s by a scientist named Joseph Swan. Swan, and other scientists like Chardonnet were concerned about the use of naturally occurring plant and animal fibers being depleted for the creation of fabrics (i.e. the silkworm), so they set out to make a man-made fiber that both felt great and wasn’t killing off the worm population. Mr. Chardonnet’s invention was SILK! So, in defense of synthetics, I always like to repeat that they were originally created with a very heartfelt purpose – to save the plants and animals! Now, for the chemistry nerds (like me) out there: the original synthetics were a combination of cellulose (polysaccharides and glucose), mixed with air, water, limestone, coal, and/or petroleum. Depending on what fabric functionality you’d like to have, modern scientists can combine various fibers through chemical synthesis to produce the look, feel, and functionality that you’re aiming for in your final product. Why does this matter? I just want to sleep better tonight! In designing Wicked Sheets, we set out to come up with the greatest combination of functionality, fit, and feel. So, in addition to those wonderful moisture-wicking and cooling components we’re always talking about, our feel is always soft to the touch, and our fit goes 2-ways, ensuring you’ll always know which way the sheet goes onto the bed. Just follow the seams down the side of your mattress from head to toe and it will always fit as snug as a bug in a….bed! We hope this has been helpful in explaining the difference in 2-way and 4-way stretch! Here’s to some wicked good dreams! https://wickedsheets.com/wp-content/uploads/2018/08/2-way-vs-4-way-stretch-blog-hero.jpg 800 800 Alli Truttmann https://wickedsheets.com/wp-content/uploads/2016/01/wicked_sheets_logo-1.png Alli Truttmann2018-08-02 19:24:562018-08-02 19:26:57What's the difference between 2-way and 4-way stretch? Hope Scarves, Wicked Sheets & Entrepreneurship Why am I sweating at night?